The Hawaiian Islands – Which One is Best for you? As a first time visitor to the Hawaiian islands, it’s really hard to choose which islands to head to. When I organised our initial trip to Hawaii I did lots and lots of research but I still found it hard to decide. Each of the islands has its own unique charms and personality. Ideally you’d visit them all, but of course, for most of us, that’s not practical. Which island makes sense for you will also heavily depend on the type of vacation that you’re after. The Wailua Falls in Kauai. There are eight main islands in the Hawaiian Islands archipelago but only six can be visited by tourists. That’s probably just as well because it makes the decision that little bit easier! Of those six the four most popular islands are Oahu, Hawaii, Maui and Kauai. 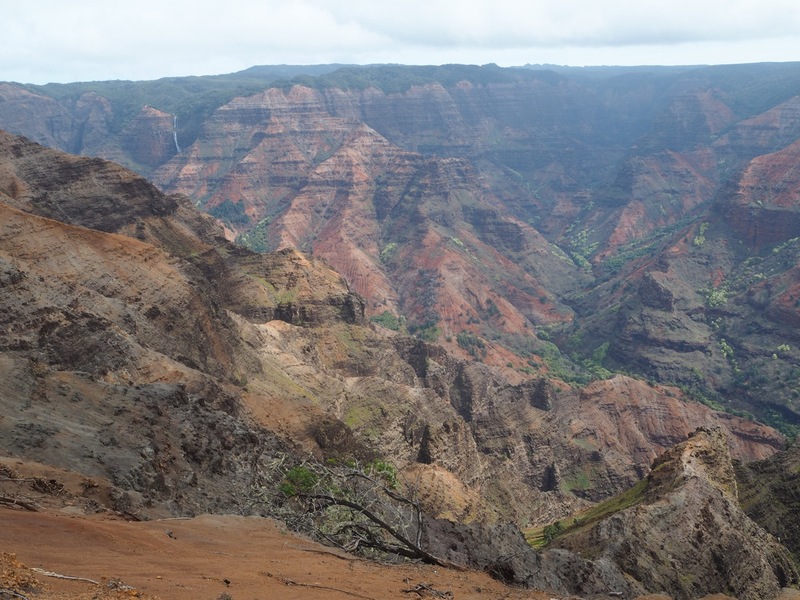 Lanai and Molokai are a little bit off the beaten track and a lot less visited. But you shouldn’t discount them because they also have a lot to offer tourists. 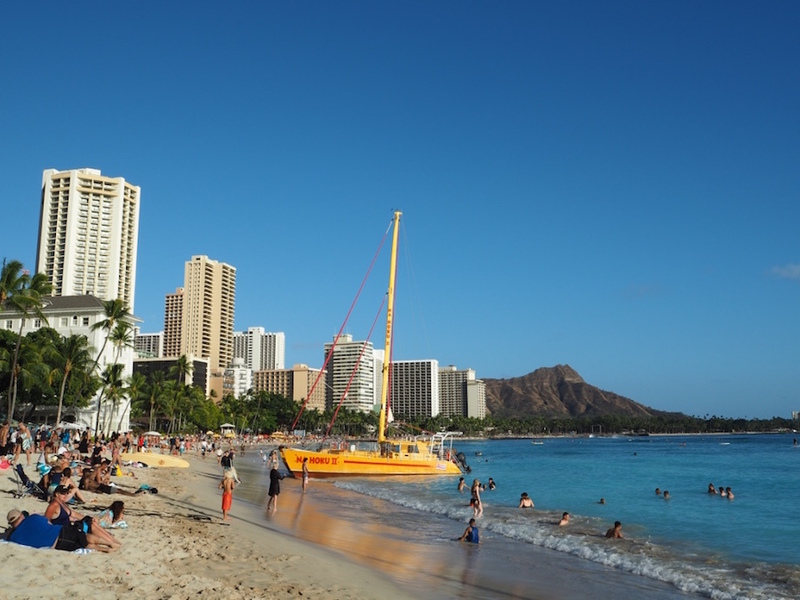 Oahu is home to the bustling capital city of Honolulu and it’s where you’ll find the famous Waikiki beach. It’s the most visited island in Hawaii and it attracts more than five million visitors every year. Unless you’re arriving from the U.S mainland, your entry point to the Hawaiian Islands will be Honolulu airport. Because it contains Hawaii’s capital city, Oahu is the most inhabited of the islands. That means that when compared to the other islands it feels a lot more crowded. But if you venture out of bustling Waikiki you can still find some peace and quiet. Plus just like the other Hawaiian Islands, Oahu offers some incredible scenery, some terrific hiking and many beautiful beaches. The famous Waikiki Beach in Honolulu. If you’re after exciting nightlife, then there’s only one place for you in Hawaii, and that’s Waikiki. With so many bars and nightclubs to choose from, you could easily stay up all night, every night of your trip. If you love to shop until you drop then Oahu is the only island that really offers a fantastic shopping experience. Whether you’re enjoying the high-end shops on Kalakaua Avenue or hitting the Ala Moana mall, the largest open-air shopping centre in the world, you may need a spare suitcase for the flight home. Oahu is home to extensive museums and galleries. It’s also home to the most visited museum in Hawaii, the Pearl Harbour Museum with the USS Arizona Memorial. This is a must visit while on Oahu. You’ll learn all about the attack on Pearl Harbour and the United States’ subsequent entry into the second world war. 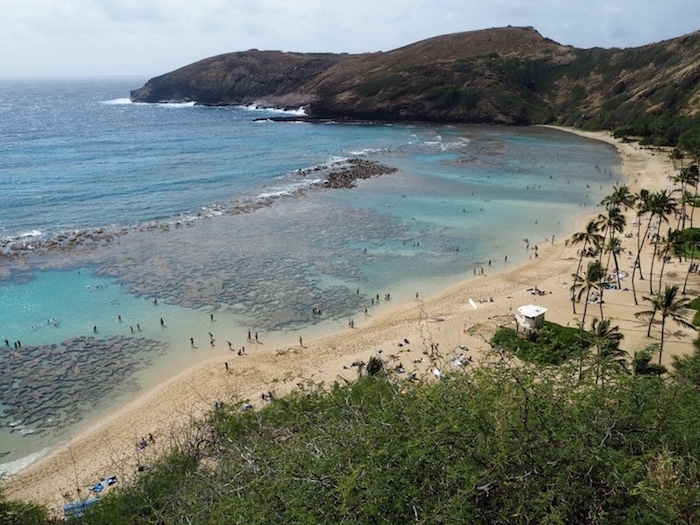 The beautiful view over Hanauma Bay. For the foodies among you, Honolulu offers the best fine dining in the state and a great variety of cuisines. Be it tropical island flavours, French, Italian, Asian, or Mexican, you are in for a very refreshing culinary experience! Surfing is the king sport in Hawaii, and Oahu holds some of the world’s biggest surfing competitions on its north shore every year. 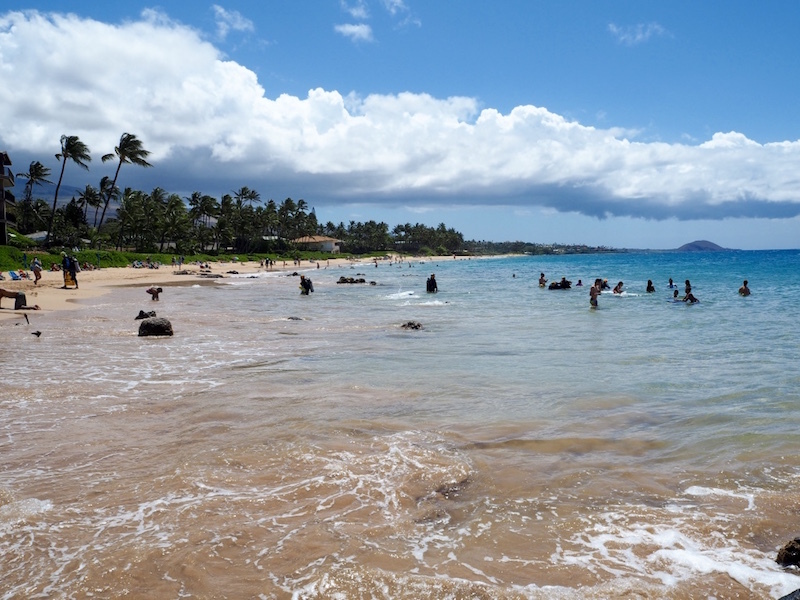 Surfing Oahu’s northern beaches is the key attraction for many surfers visiting Hawaii. If you like to combine big city life with stunning scenery and gorgeous beaches, then this is the island for you. 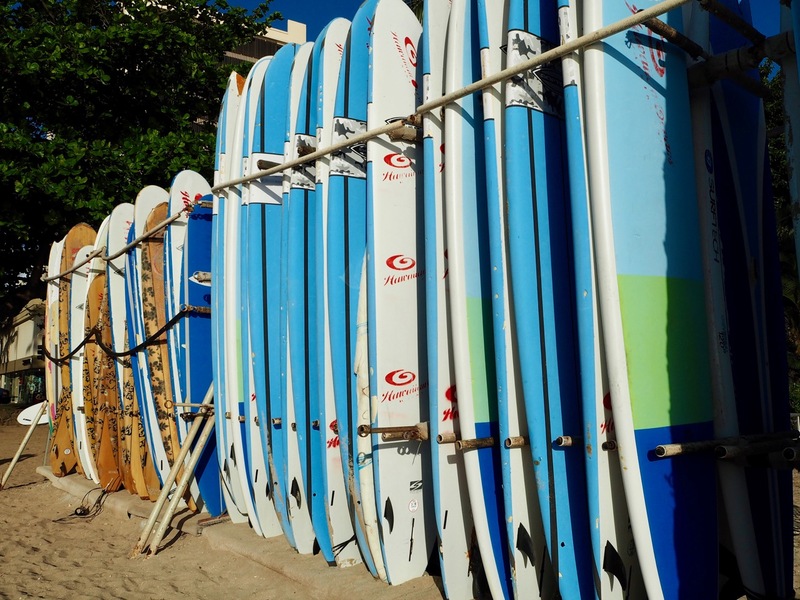 Many surfboards on Waikiki Beach. Maui is the second most visited island in Hawaii with more than two and a half million visitors every year. It is also the second-largest island in the archipelago. 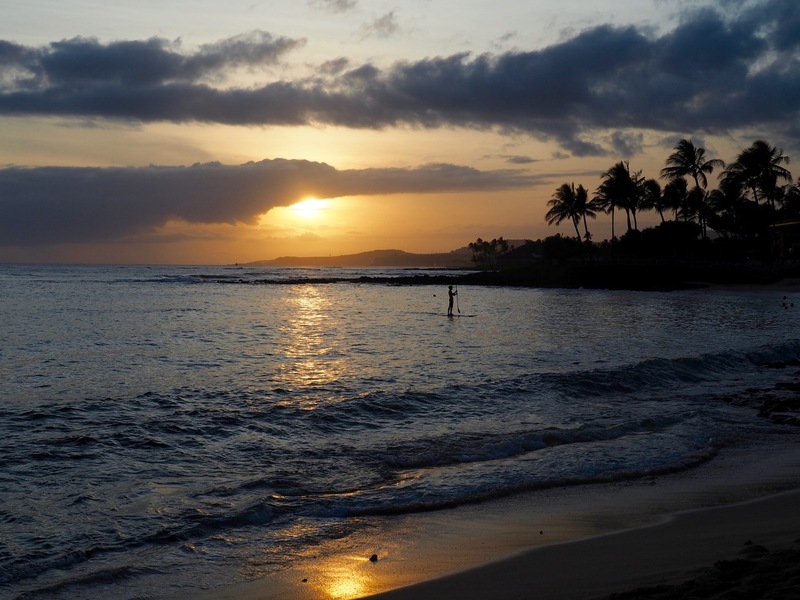 Thanks to its stunning sunset vistas and beautiful golden beaches Maui takes the award for being the most romantic Hawaiian island. It is, therefore, a favourite with honeymooners. But it’s not just about the beaches; Maui offers some spectacular coastal drives, flowing waterfalls, magnificent hikes, and lush green valleys and mountains. There are lots of activities to do for all ages, making it a very popular island with families. The Waimoku falls at the end of the Pipiwai Trail. The most popular activity on Maui is snorkelling and for good reason. 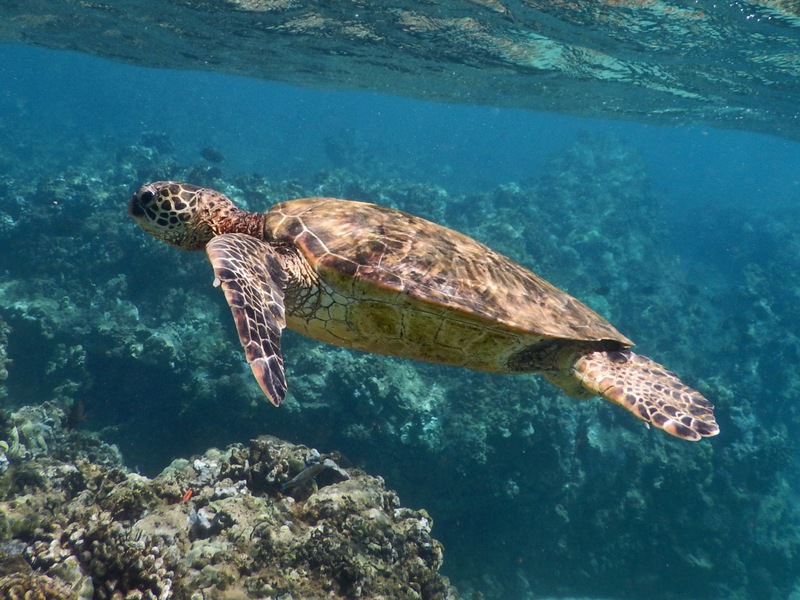 Maui has some of the best snorkelling in Hawaii with a huge diversity of marine life and an abundance of Green Sea Turtles. A friendly turtle on Maui. Although there are less fancy dining options than in Oahu, Maui is all about the farm to plate food experience. Whether you prefer food trucks or fine dining, Maui will provide you with an exceptional dining experience, with fabulous flavours and some of the freshest food you can find. If you want to avoid rain while on holiday then Maui’s weather is the best of all the Hawaiian islands. If you stay in West Maui or on the South Coast you are almost guaranteed sunshine throughout your stay, even in the winter months. Stunning scenery on the Road to Hana. Hawaii is home to five volcanoes (two of which are still active) and is bigger than all of the other islands combined. So make sure you allow plenty of time if you choose to visit this island. 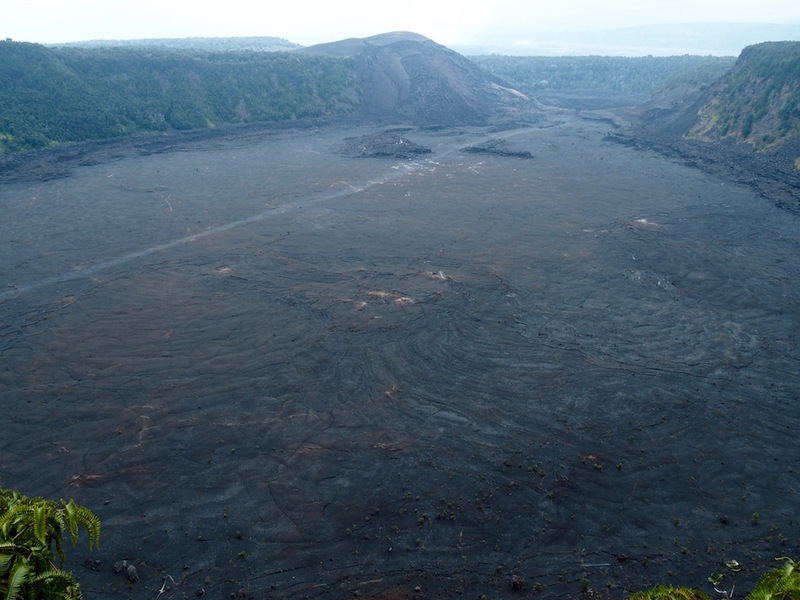 Visit Kilauea, the earth’s most active volcano. If you are lucky you might even get to see red hot lava flowing over the cliffs down into the ocean. You can hike down into a dormant crater to experience a spectacular volcanic landscape, where you’ll feel like you’re on another planet. 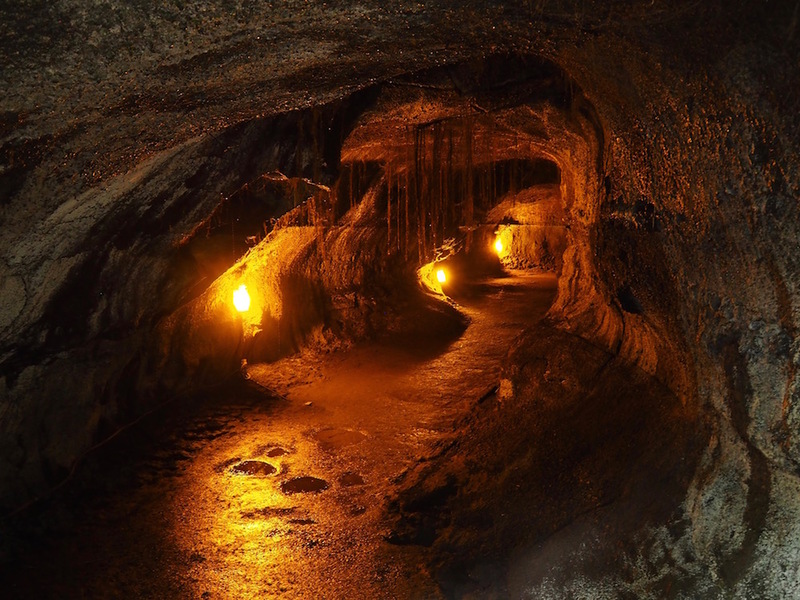 You can walk through a five-hundred-year-old lava tube, or wander along a path surrounded by active volcanic steam vents. A visit to the Hawaiian Volcanoes National Park is one of the most incredible experiences you can have. Although the biggest reason to go to the Big Island is to explore the volcano, it’s by no means the only thing it has to offer. The snorkelling on the island is exceptional, with some of the best snorkelling spots in the state. 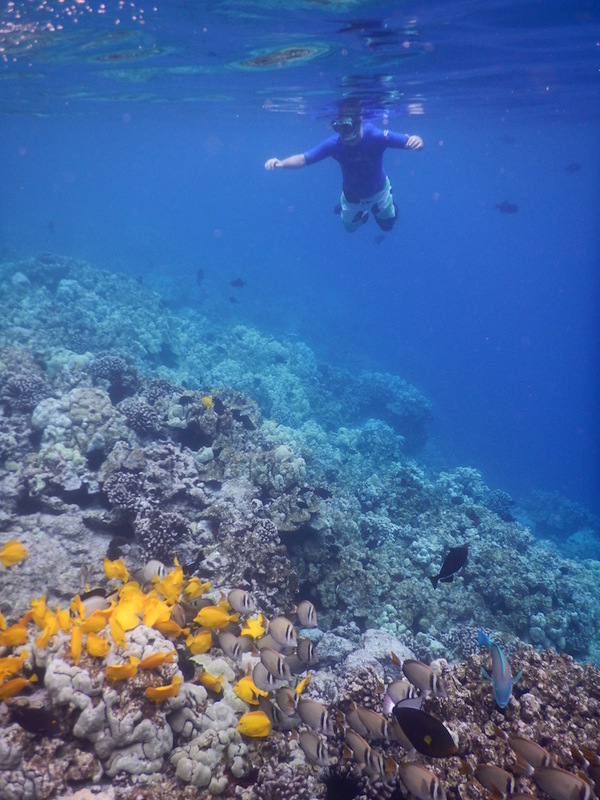 It has stunning coral formations, a very healthy population of tropical fish and the best water clarity. Awesome snorkelling at Kealakekua Bay. Hawaii is the island with the most contrasting and diverse landscapes. It has tropical forests, lava-rock deserts, dense jungles, plentiful waterfalls, deep valleys, and black, golden and even green sandy beaches! You’ll find them all on the Big Island. If you love watching wildlife then you won’t be disappointed. On Hawaii, you can swim with pods of spinner dolphins, hang out with green sea turtles, and even snorkel at night with the Manta Rays. If you’re visiting in winter, keep your eyes peeled for humpback whales. These majestic giants spend their winters off the coast, raising their calves in Hawaii’s warm waters. If you are looking for diversity and uncrowded beauty, this is the perfect island for you. The Pu’uhonua O Honaunau National Historical Park. Kauai is the oldest, smallest and least touristy of the four major islands. What it lacks in nightlife it easily makes up for in nature with its iconic tropical scenery, incredible sunsets, rural charms and its breathtaking coastline. Most visitors to Kauai are return visitors because it’s so easy to fall in love with the island. We ourselves are addicted to this island! 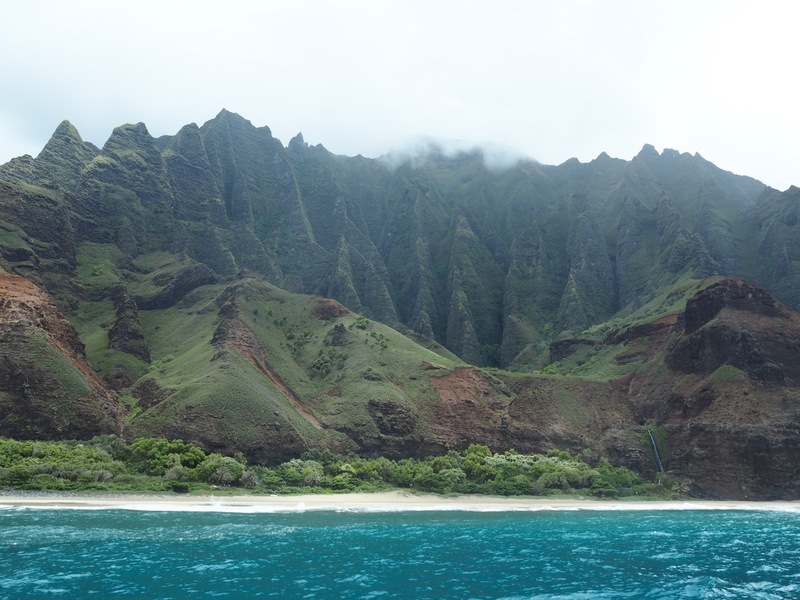 A view of the Napali Coast from the sea. Kauai is home to some of the world’s best beaches, with fifty miles of white sandy beaches. Whether you are into swimming, surfing, snorkelling, paddle boarding, body boarding or just sunbathing, you’ll easily find a beach perfect for you. 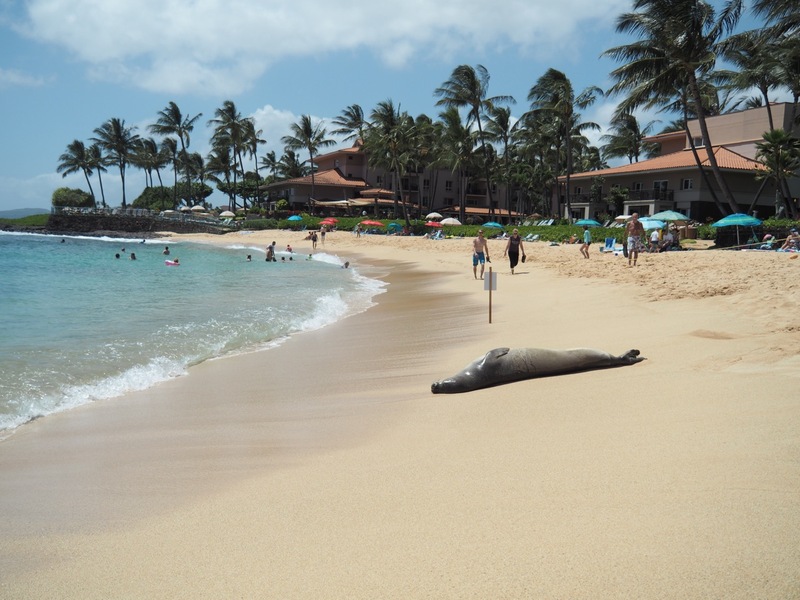 An endangered Monk Seal snoozing on Poipu beach. 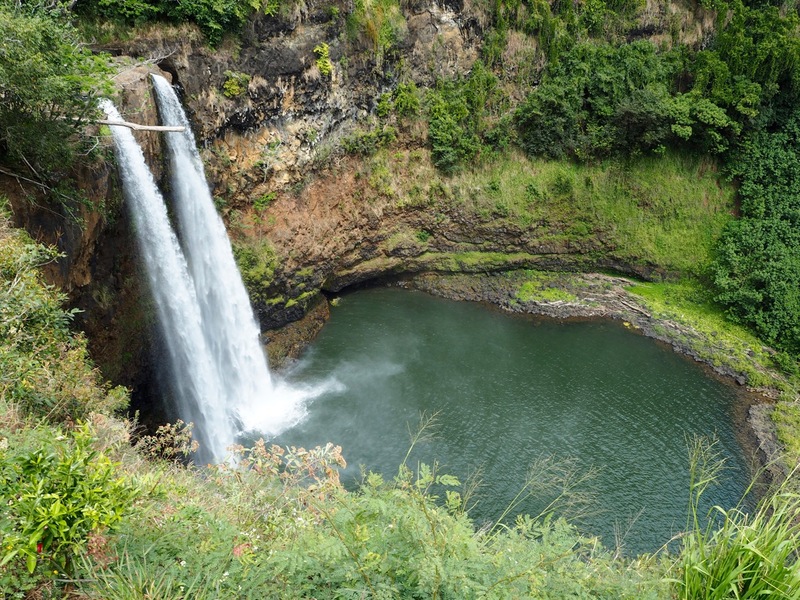 Although all of the Hawaiian islands have great hikes, Kauai offers the best hiking trails in the state. This might have something to do with some parts of the island not being accessible by car. Whatever your fitness level or hiking experience, you can find a hike on Kauai to match your ability. Every night when the sun goes down, Kauai puts on a show. Kauai has some of the most dramatic sunsets in Hawaii, and tourists and locals alike gather nightly on its beaches to enjoy them. 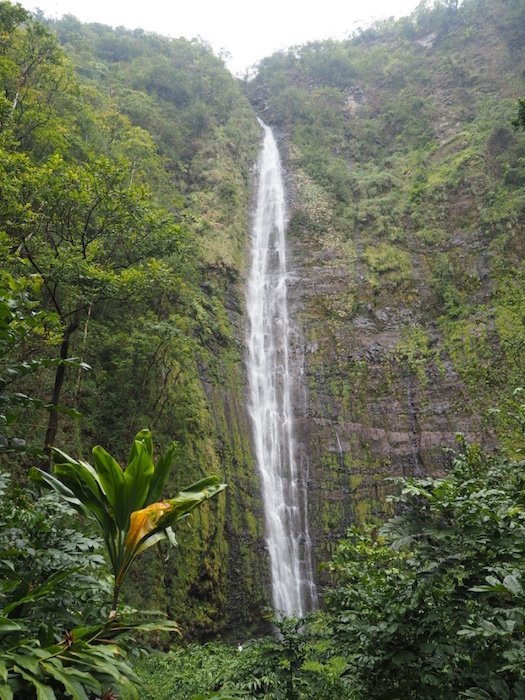 Kauai has some of the greenest and most breathtaking scenery on the planet. This does mean that it gets a large amount of rainfall, especially on the north shore. However, this means that after a heavy downpour you’ll witness some spectacular waterfalls flowing down the surrounding mountains. On our last visit, we once counted six of them from the balcony of our condo! But if that’s not good enough you can always stay on the sunny south shore. The south shore gets a lot less rain, especially in the winter months. Kauai is packed with surfing spots, and because of the trade winds, you can surf all year long. Even if surfing is not your thing, you’ll get a kick out of watching the surfers go up against the big swells while you sun yourself on the beach. If you love nature, adventure, the great outdoors, stunning scenery, and if you want to escape from the crowds and city life, then Kauai is your paradise island. 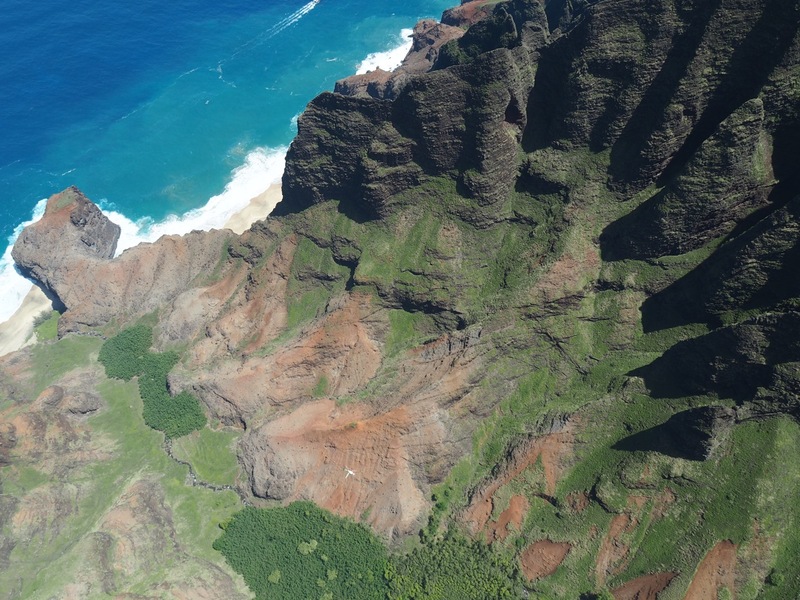 A view over the Na Pali Coast from the helicopter. With only three thousands residents, Lanai is the smallest inhabited island of the Hawaiian Islands. It’s just a short ferry ride from Lahaina on Maui, so you can easily take a detour to Lanai during your Maui getaway. There isn’t a lot to do in Lanai compared to the other Hawaiian islands. Most people will tell you not to spend more than two days there. But if you’re after pure relaxation and a bit of dolce far niente, then this just might be the island for you. Lanai has eighteen miles of beautiful sandy beaches and with so little tourists you won’t struggle to find your own private spot on one. 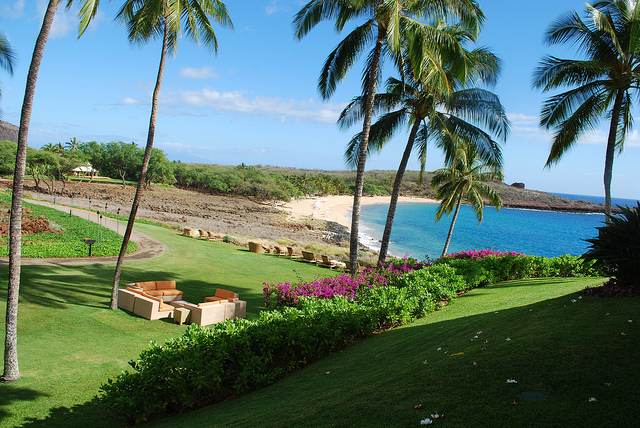 In 2012, 98% of Lanai was bought by Larry Ellison, the founder of Oracle. Ellison plans to turn Lanai into an eco-tourism destination. So there are big changes coming to this island in the future. 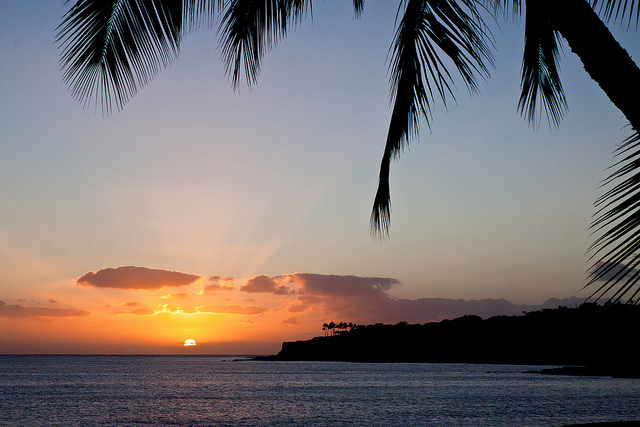 A beautiful Lanai sunset – Flickr Brandon Levinger. Relax at one of the two Four-Seasons resorts on the island. 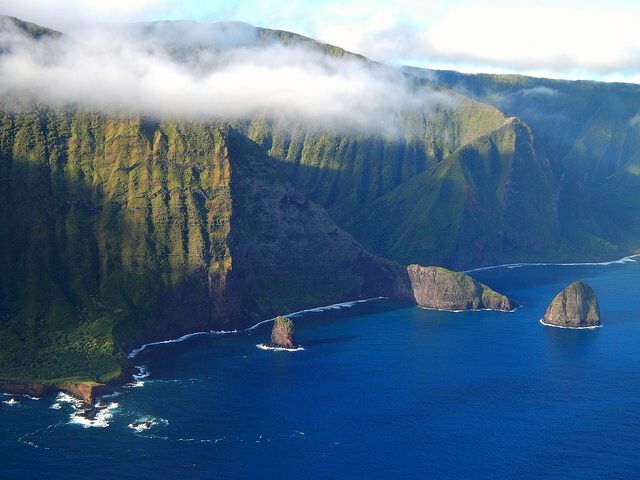 Molokai is the least visited of all the Hawaiian islands. It is very different from the other islands, with no five-star resorts, no fancy restaurants, no shopping malls, and no traffic (in fact there are no traffic lights!). It is completely non-commercialised and thankfully the locals want to keep it that way. Instead, you’ll find miles of unspoilt coastline, lush valleys, waterfalls, soaring cliffs and mountains. The Kalaupapa Peninsula – Flickr Kristina D.C. Hoeppner. Molokai is the most Hawaiian of all the Hawaiian islands with fifty percent of its inhabitants being of Hawaiian descent. So when you arrive on Molokai, you’ll receive the real “Aloha spirit”, not one put on for the tourists. 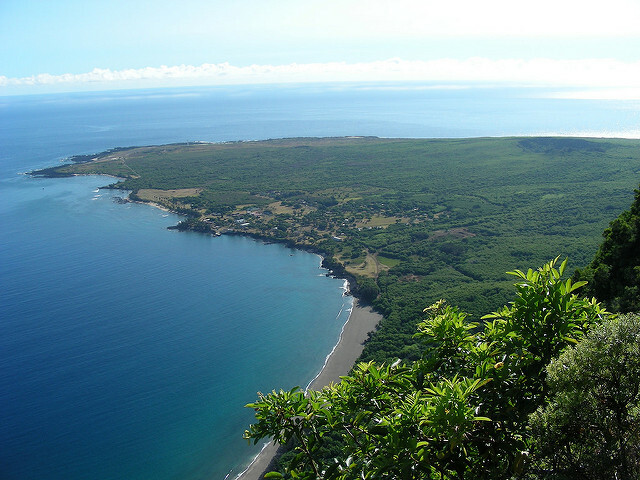 With only eight thousand locals and with only a few tourists making it to the island, Molokai will give you that real sense of seclusion. Molokai’s North Shore. Flickr Forest Starr and Kim Starr. Molokai is the island to pick if you want to experience the real Hawaii of fifty years ago. Have an entire beach to yourself! 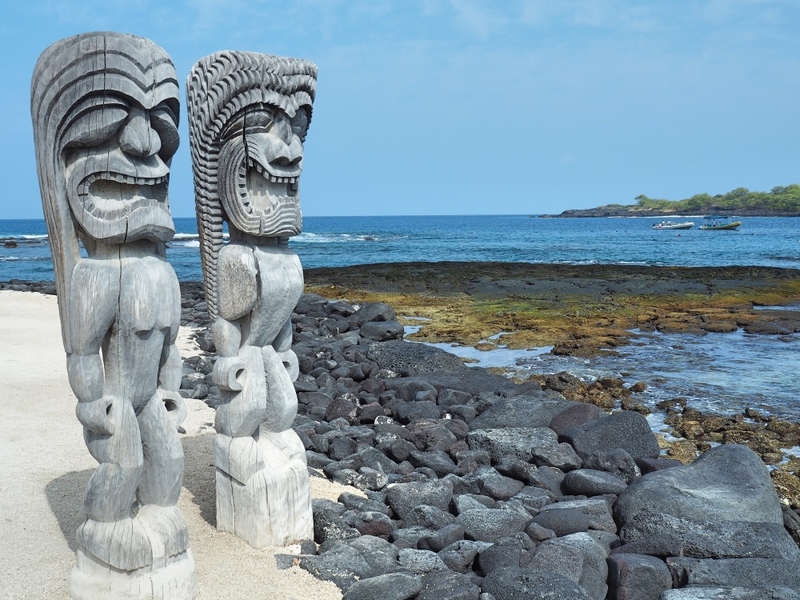 Hopefully, this guide will help you decide which Hawaiian islands are best for you. But the best thing about Hawaii is that no matter which island you choose, you can’t really go wrong. Each of them offers a great Hawaiian experience with spectacular landscapes, lush tropical vegetation, fantastic beaches, and enough activities to keep anyone happy. Because you will automatically fall in love with Hawaii, you’ll be back there before long, so you can always explore another island the second and third time around! If you’ve been to the Hawaiian Islands, please comment below and let us know which island is your favourite and why. Mahalo for reading! This is really helpful. I would say after reading your advice, that Oahu is not for me – I’m not into big crowds, nor nightlife, and I’d probably not enjoy this island that much. I love the sound of the farm to plate dining on Maui, and that you can go inland and enjoy the lush landscapes and waterfalls there too. I’m not a big beach baby so that appeals. If Hawaii offers great wildlife and volcanos too, that’s another big attraction for me — we love our wildlife holidays hugely. Kauai looks beautiful but we are not much into hiking or water sports and I think Lanai is a little too lacking in things to do for us. Great resource, really helpful! I am glad you are finding this helpful. I am sure you will love Hawaii wherever you choose to go. It is probably difficult to choose a fav one from the lot. All have varying landscapes and uniqueness. I would love visit all of them. That photo of the turtle is incredible and the snorkelling with the fish. It’s also interesting to see that there is a canyon. Lots of great ideas for exploring Hawaii. Turtles, caves and waterfalls. Wow! Hawaii is a paradise indeed. Love your photos and I’m having trouble deciding which island I love best. We were just in Maui in April and LOVED IT! Like you said, it is an ideal place for couples and honeymooners. I can’t wait to go back to Hawaii and explore the other islands, especially Molokai and the Big Island! Oahu has some beautiful places especially the North Shore, we loved it there but if you every get a chance to go and explore further you should definitely do it! Hawaii has so much to offer. Wow I bet this was an incredible wedding! Maui is beautiful, we absolutely loved it too. But yes, Kauai is the best for outdoor enthusiasts and we are one of those too:-). I am sure you would love it too. Having never been to Hawaii and having only dreamt about it, I find Hawaii a veritable paradise. Would be at a real loss to choose between these gems. But fro what I have read, I think if I had to choose it would be Maui. Maui is incredible. I am sure you would love it. Hopefully your dream becomes reality soon. I’ve always been put off by reports of the high costs and overabundant tourists in Hawaii, but as a lover of natural attractions and outdoor activities off the beaten trail with less tourists, I’m starting to think Kauai or Molokai just might make it onto my travel destination list! I have to say I felt exactly the same at first. I wasn’t keen on Hawaii either. Everytime I thought of Hawaii, I saw Waikiki, tourists everywhere, big hotels. But after hearing many people raving about it we decided to give it a try. We knew Waikiki wasn’t for us and we did a lot of research. We ended up falling in love with Hawaii and with Kauai especially. It’s so beautiful and a lot less touristy. It’s relaxing and exciting at the same time. Hawaii has a place for any kind of traveller. Even for people who just want peace and quiet. What a great in depth view. I’ve so far only visited Oahu and the Big Island. They are so drastically different! Yes they really are. 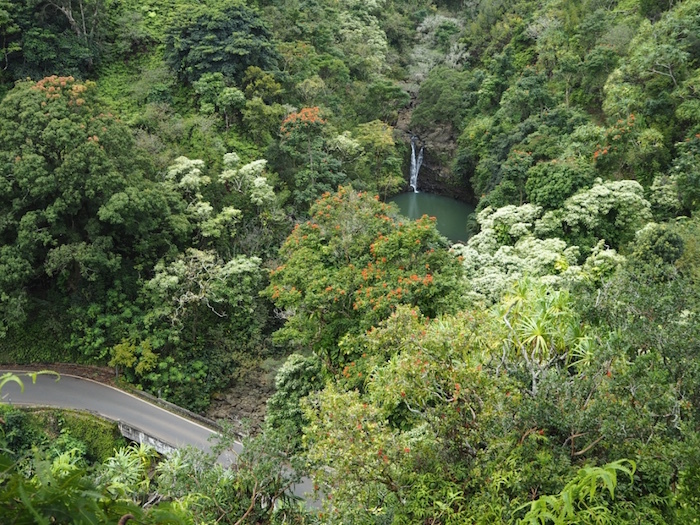 The Big Island is one of a kind… so diverse! wow, you make me wanted to go to Hawaii now. soon I can tick off that in my bucket list. I think I would love to visit Maui or Kauai! 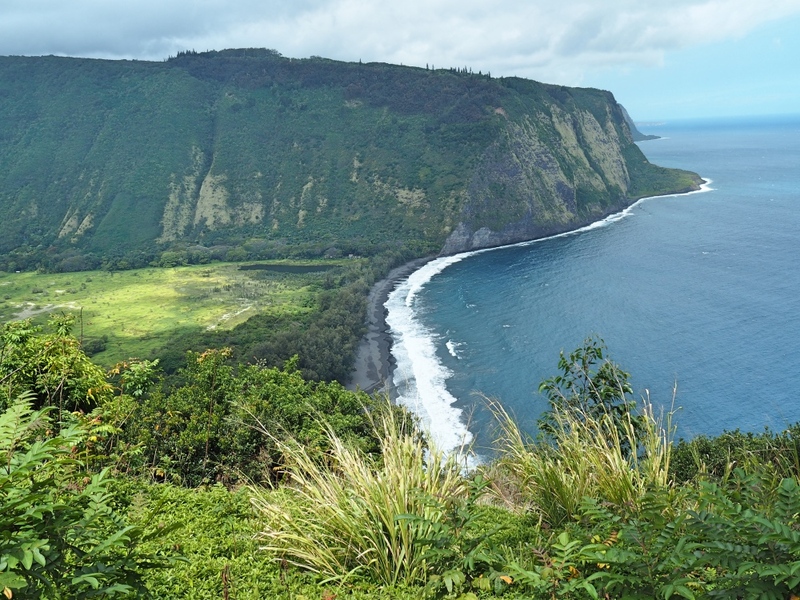 Kalaupapa Trail is on my bucketlist! Although it seems more like problem of plenty! Hawaii is so beautiful. I wish it was not so far away for me! Molokai sounds the place for me. That last photo makes it look like the lost world, so awesome! Would also love to get a bit of that true aloha loving. All the islands sound great though. Thanks for sharing! These islands seem like being part of paradise, Cindy! I would love to visit and explore all of them. How many days are enough to see all the highlights there? Hi Agnes, I’d suggest at least a week per island for Hawaii, Kauai, Oahu and Maui. Those 4 have so much to do. For Lanai a couple of days would be enough. And Molokai 3-4 days.